The Pentagon's current leadership is motivated to change the procurement culture, Hyten said. They "understand the need" to speed up the modernization of space systems. 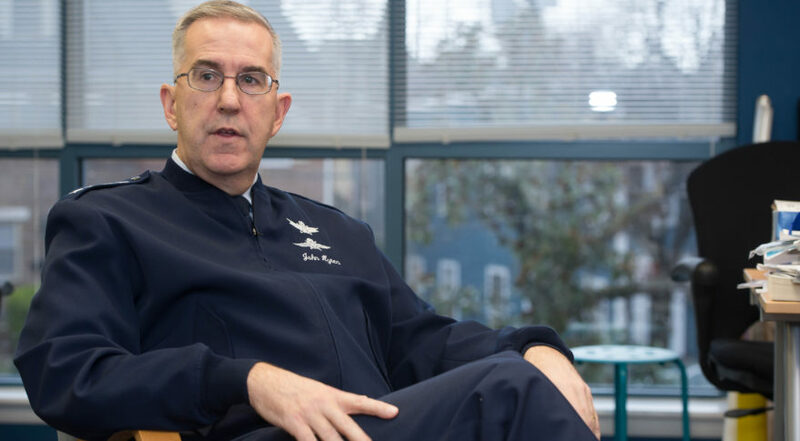 WASHINGTON — Air Force Gen. John Hyten has been insistent that U.S. military space programs need to “go faster” as adversaries continue to close in on the United States. Hyten, the commander of U.S. Strategic Command based in Omaha, Nebraska, oversees the nation’s nuclear and space missions and has been outspoken in his criticism of the Pentagon’s procurement methods and technology choices. The military space budget is getting a big boost in fiscal year 2019. But moving faster in space is about more than just bigger budgets. It also will require changing the culture of buying “exquisite” launch vehicles and satellites, Hyten said during a wide-ranging interview with SpaceNews reporters. “I know it’s doable,” Hyten said. Today’s military satellites — many with billion-dollar prices tags — were designed for a different time, when spacecraft in orbit were not seen as potential enemy targets. Hyten and others have argued that the next batch of satellites should be smaller and cheaper so they could be quickly replaced during a conflict if they came under attack. One obstacle that Hyten and other officials worry about is a Pentagon bureaucracy that spends years analyzing and defining “requirements,” which can slow down a program considerably even before development begins. “I have this conversation frequently with General Paul Selva,” Hyten said. Selva is vice chairman of the Joint Chiefs of Staff and leads the Joint Requirements Oversight Council, a panel of four-star vice chiefs of the military services. President Trump shook up the military space world last week when he endorsed the creation of a “space force” as a separate branch of the service. His comments energized congressional proponents of an independent space corps, an idea strongly opposed by the Pentagon and the Air Force.